An apparent increase in the number and types of counterfeit gold and silver coins in the marketplace underscores the crucial importance of buying only from expert, reputable dealers, cautions the Professional Numismatists Guild. Many of the fakes apparently are originating in China and then offered online by various sellers. Beware of counterfeit vintage rare coins and fake modern gold and silver bullion items now being offered in the marketplace. Purchase only from reputable dealers, cautions the Professional Numismatists Guild (http://www.PNGdealers.org). The PNG is a nonprofit organization composed of many of the country’s top numismatic experts. “It is clear there is an increase in the types of fakes sold by unscrupulous dealers. These sales of counterfeit coins are potentially a multi-million dollar problem for the public. There’s an old saying that can help buyers avoid problems: If you don’t know coins, you better know your dealer,” stated Professional Numismatists Guild (PNG) President Dana Samuelson. “We conducted an informal inquiry of PNG members and PNG Accredited Precious Metals Dealers (APMD) about what they’re encountering now in the marketplace. They have seen everything from counterfeits of vintage rare coins to modern precious metal items. These include fakes of popular century-old U.S. Morgan and Peace design silver dollars to current gold and silver American Eagles, gold U.S. Buffalo coins, silver and gold Chinese Pandas, and Canadian silver and gold Maple Leaf coins. We’re also seeing spurious gold and silver ingots,” said Samuelson. “Professional dealers who look at classic U.S. coins and bullion items all day long are usually not fooled by these spurious items, but to the untrained eye they often look like the real thing,” he explained. “Many of the fakes apparently are originating in China and then offered online by various sellers. It is imperative that collectors, investors and the general public deal only with reputable, knowledgeable experts who offer a guarantee of authenticity,” emphasized Samuelson. Two PNG members who recently were in Asia say they saw counterfeits of early 19th century Draped Bust, mid 19th century Seated Liberty and late 19th and early 20th century Morgan and Peace silver dollars being sold in flea markets in China and Hong Kong for $1 to $3 each. Unsuspecting buyers have submitted counterfeit modern bullion coins to Numismatic Guaranty Corporation (http://www.NGCcoin.com) for authentication and grading. 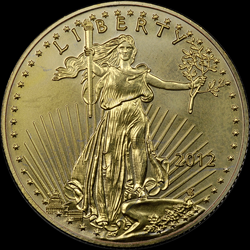 NGC, the official grading service of PNG, earlier reported submissions of counterfeit 2012-dated gold American Eagle $50 denomination coins. Those particular counterfeits exhibit poorly defined details around Liberty's face and hair, different fonts for lettering and the date compared to genuine coins and the color is different because the fakes are not composed of gold, according to Max Spiegel, a Vice President of Certified Collectibles Group, NGC’s parent company. PNG and PNG Accredited Precious Metals Dealers must adhere to a strict Code of Ethics in the buying and selling of numismatic merchandise including bullion coins, precious metal rounds and ingots, and they offer a guarantee of authenticity for the numismatic items they sell. For a list of PNG-APMD members visit http://www.PNGdealers.org and click on the APMD navigation link.